The phenomenon of ‘pre-purchase’ is a sign of star power in our fast-moving consumer world. If the hype is big enough, people are willing to pay full price for a product without full knowledge of how good it really is. Guaranteed revenue before review is a coup for any film, record and publishing company trying to win in a market of short-attention spans. 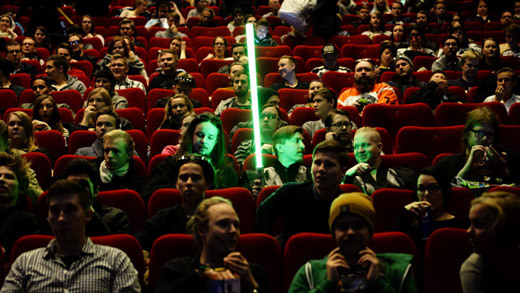 Disney made $100 million in ticket pre-orders from Star Wars: The Force Awakens. The latest Harry Potter book only took hours to hit number 1 in book sales, and it won’t even be released until July. The reason why people invest in experiences purely on faith comes from the same place that favors potential over achievement. A person who walks into my office with a list of degrees and awards shows a level of skill. But when I meet a person who may not have as many achievements, but whose thinking, articulation and attitude show me that he/she is capable of accomplishing great things – that gets me excited. The possibility of what can be done is a lot more appealing than what you know will be done. This is why Beyoncé can sell tickets for a world tour in advance of an album she has yet to release. So why are we attracted to the unknown? Apparently it’s a human psychological bias that leans us in that direction. A study by Stanford University professor Zakary Tormala explains that it is the mystery that draws us in. “It's as if people engage more as they try to work through the uncertainty and figure out what the truth will be,” says Tormala. Superbosses, a term coined by academic Sydney Finkelstein, are particularly aware of the importance of incorporating people with potential into groups of achievers. The key is to not limit what these unique individuals can do by putting them into an assigned box. That just kills potential. Finkelstein gives some good examples in an article in the Harvard Business Review from iconic institutions like Alice Waters’s Chez Panisse restaurant, George Lucas’s Industrial Light and Magic and Saturday Night Live. All this light on potential is not, however, a reason to discount achievement. Racking up accomplishments is good. People with potential have to eventually realize their abilities else they remain ‘could’ves’. Knowing that you have people in your team who can perform based on their track record, is important for any leader. Ultimately, you hire for capability. Looking for potential is just discovering the capability that may not be so obvious.